Enter the Excalibur 36 Shooting Star timepiece, enriched with alternative techniques and featuring a choice of blue, white and pink interpretations, all issued in eight-piece limited editions. The result of two years of R&D in Roger Dubuis' legendary Geneva workshops were devoted to miniaturising the existing X42 single tourbillon while retaining all of its lightness and airy dimensions. The new RD510SQ Poin�on de Gen�ve-certified calibre –is a diminutive yet bold work of art ideally suited to smaller wrists. Based on an iconic platform, it is equipped with one of the smallest flying tourbillon skeleton caliber to fit in a dainty 36-mm case. Shining in a feminine starry sky set against a white mother-of-pearl, blue PVD-treated or pink translucent varnished background, the 18K gold shooting star timepiece loops around the Roger. 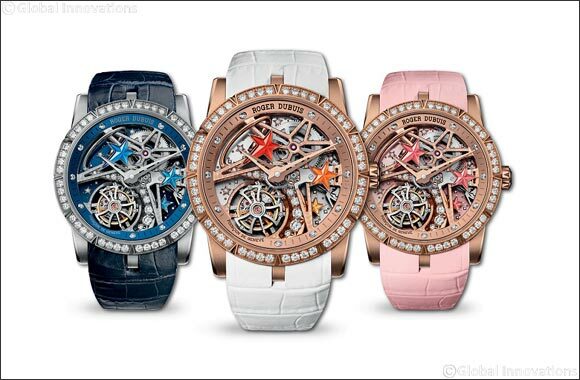 Dubuis astral signature, trailing its diamond-studded tail and complemented by colour-coordinated enamel stars.